These last few months of freedom have really been a blessing. I've done a lot of traveling in some pretty far off and far out places in Japan and gotten a chance to meet new people and, of course, sell a bunch of CDs. January a dream came true because in spite of criticism from a variety of sources about the financial cost of it, I followed my heart, took a trip to America and finally got a chance to introduce my daughters to the country of my birth and their family there. We spent over 3 weeks there and traveled from N.Y. to as far south as North Carolina. We met friends and family, went to museums, planetariums, saw a bit of the inauguration (on TV) and they saw, touched and played with lots of animals they have never seen before (except on TV:) They saw snow, deep snow, ice skating, chased wild geese, did rock climbing, drove a mini 4 wheel vehicle in the snow, and saw the beauty of the rolling Virginia landscape with grazing cows and horses. Best of all they got to play with American kids and were immediately happily surprised at how friendly and open they are, and better still, because they themselves look like Americans they were immediately accepted and welcomed by children in the states. And they came back here speaking English with a new feeling of self confidence and belonging...to something other than Japan. Oh yeah, it was definitely worth the expense. There were heartaches. That's all par for the course when I return home. Family and friends provided their share of disappointment. I spent a lot of times licking my wounds when I came back but ironically these disappointments and heartbreaks have only fueled my creativity back here. I'm thankful for my sensitivity to others and my renewed faith in my own mission. Taking a break from music, and just being a father, caring for my children and giving them all of my time was definitely a growth phenomenon for me. I learned a lot about what it takes to take care of two young girls and most of all learned that I am up to the task. It was astonishing to discover so much internal reserves of energy. And the break from music gave me a new perspective now that I'm back in the studio. I'm really happy to have time to work on this new CD which, unlike previous versions, has no deadlines built into its production. I still have enough reserves of Many Splendid Things to have a product available if people ask for it, and time to make this a labor of love. Its a joy to wake up every day and be working for yourself, to have enough time to practice, stay in shape, read, study, write and generally manage one's life. As March approaches and my spring calendar starts to fill up there's a determination to keep things in perspective and continue to place a higher value on life management and not get caught up in the rat race...to make every day count and continue to live in the balance that's available to all of us when we get our priorities straight. I'm thankful for the friends, partners and family members who have stood by me through these uncertain times and kept faith in me. Of course I plan to surpass all of your expectations in the very near future. Those of you familiar with the legend, already know that one of the reasons I first came to Japan was on the advice of Quincy Jones to get out of America, out of the hotel circuit and to broaden my horizons. Since living here, I have never taken a full time hotel job, but last year, was an exception. On September 8, I will be coming to the end of a 10 month engagement at the Ritz Carlton Hotel in Osaka Japan. As I was the first pianist to appear here for two weeks when they opened 10 years ago, it was only fitting that they asked me to return on their 10th year anniversary. Although the schedule (six nights/week performing four 40 minute shows, with only 20 minute breaks between them) has been described as 'grueling' by other musicians it has been a very enjoyable gig for me. Yeah, I admire the Japanese work ethic too, and to some extent have acclimated myself to it. But its just not natural, and certainly not suited to the American temperament. Now that I have a break from this job and had two days of rest I finally realized how tired I was. A couple brothers I know in the entertainment business have been hospitalized in the last couple months from a combination of overwork and stress. And of course Japan is the only country in the world that has an actual condition called "Karoshi," where a person just drops dead from overwork. Most people are working just to survive. Big companies know that and are using that fear and desperation as a weapon. Their not so secret slogan and philosophy is "Work till you Die!" McDonald's is in court over here for forcing managers to work overtime without pay, and making people work overtime either without pay or at the regular rate is a common, though illegal practice. McDonalds and a lot of other multinational corporations have slid in here and are trying the same tactics the Japanese corporations use. Other companies are in court for making people "managers" although they have no supervisory status, staff or power to set their own schedules. Its just another way to keep from paying them overtime or at the hourly rates that regular workers would get. Right now, its a great feeling to be getting up every day and working for myself. My apologies for not having been able to communicate as frequently as I wanted to, but for the next 6 months at least, you will be hearing more from me because I'll be taking some time off to pursue so many areas that I have neglected, including family, recording my newest CD and of course, you my friends. I just want to thank you for being here for me and let you know that I am here for you too, with love and respect. As for the new CD, I decided to take a break from it for a couple of days. Been going at it every day for 2 and a half months and pushing too many other things on the side. I want this to be fun not another job, and I want to make sure all the tracks are perfect and really something I can be proud of. So, before it starts getting stressful, trying to meet some self-imposed deadline, which has already passed, I'm spending a little more time on balancing my life. Doing what the guy in the 7 habits calls, "sharpening the saw." Taking time out for my physical, mental, spiritual and emotional well-being. So I'm working out more, reading, writing, visualizing and meditating more. And I feel a lot better about that. This has turned out to be much harder and more time-consuming than my original plan. After hearing the first 6 songs and running them past my manager, listening to her comments, a lot of things have to be re-done and refined, so my plan for being finished before the summer has been shelved. I'm going at it with a different approach and moving at a slower more meticulous pace. Not much yet. 6 songs so far are close to completion. I'd be a lot further along if I wasn't working 6 days a week. Maybee:) It looks like I'm turning the corner on the first 6 songs which are all covers and they definitely have some unique arrangements. Tuesday was my day off and I did Amazing Grace. The introduction to the song is going to blow your mind. Its something in the vein of the kind of music I really want to do. See, even though that Perfect Love is sold out, a lotta folks have been asking for some of the tunes that are on there over and over again..like Amazing Grace, Pianoman, Honesty, and even Titanic. A guy called the office a couple of weeks ago and said he saw the Japanese website and just Had to have a copy of Perfect Love, for his "Walter Clark Collection." (???!!??) I still had a couple wrapped in plastic and he plunked down $25 plus shipping for one copy. Then there's stuff that folks back home would just consider plain old hokey. Songs like When you wish upon a star, and Somewhere over the rainbow....and even....(sit down on this one, before you fall down) I can't help falling in love with you, by Elvis. Some folks, seeing these tunes on the cover, and me singing them will automatically buy them on the spot, and since the americans are not supporting my music at all its imperative for me to continue to target those listeners and own my own niche. I got babies to feed! Getting a couple hundred hits a day on my english webpage is nice, especially when my page used to get 10 hts a year, but that still hasn't translated into many sales. Sales come from me personally performing and asking members of the audience if they would be interested in a CD. After they buy many of them come back and tell me that they love the CD and are waiting for my next. Some tell me that the CD creates a healing atmosphere in their homes. Many more tell me that they listen to it every day, and request songs from the album. But how do I get americans to become interested? Spend a lot of money to make a slick video and hope for the best? The fact that I perform in the Ritz Carlton doesn't seem to be enough to assure them that their little $13.50 would be money well spent...and neither does genuine reviews from satisfied customers. And i'm supposed to rack my brains trying to figure out how to gain favor with americans. Its not like I'm doing this music in Japanese. Its in English, but that doesn't cut no ice either. Here's a statistic that puts it all in perspective. For every 1 CD sold in america, 500 are sold in Japan. So, I guess the answer is just "Wait and See," 'cause I hardly even know. One thing's for sure. Its getting to be FUN doing this, and that opens the door to more creativity in the future. The whole stress factor of recording something has been dramatically reduced. Not trying to do something "slick" because simplicity is the name of my game. But these cuts just happen to sound much more polished than previous efforts. I'm in "the recording mode" now which means I don't get much time to do or think about anything else. Its like I become possessed, but its for a good cause. Tuesday was my day off, but I didn't sleep at all or leave the house. They say it takes a year to do a CD, and although it has taken me over two weeks to get one song half ready I still intend to have this one finished before it gets hot over here. My only requirements are that it sound way better than the last one. Anyway, its very stressful, but a learning experience. My old lady just texted me to remind me I'm going on the road tomorrow, which I had totally forgot, so I have to hurry and pack up a few things tonight, and check into a hotel when I get to Osaka. Doing a wedding out in the boondocks. I put those kind of jobs on hold since I got the Ritz, but this group offered me 4 bills to perform 4 songs, which is not something to turn your nose up to. So, after Friday nights gig, I'll sleep for a couple hours in Osaka, catch the bullet up to the country for a Saturday morning wedding and shoot back here in time for Saturday night's usual gig. If it doesn't completely burn me out, I might try it again next time they offer. Recording's moving along, a little faster, as I get used to it more. After about 20 takes, I finished 2 tracks (bass and strings) on that one song in 2 hours last night. That's a snail's pace, but faster than before. Will write again when the smoke clears from this gig, but I have to go to bed early tonight. Many Splendid Things, our fastest selling CD was re-released this month for sales in Japan. There are still a few copies remaining in America, but there are currently no plans to re-stock that market. has begun to market Many Splendid Things, which will also appear on its homepage starting in Februrary. Many Splendid Things goes on sale at CD Baby! CDs may be purchased online here at our Japanese web site. We expect to have a link, sound samples and sales page available on CDBaby by November 8. Finally! 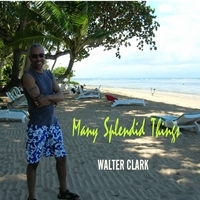 We received a firm delivery date for the latest version of Many Splendid Things. The album will go on sale October 31 in Japan. Sales in the U.S. and other countries will begin November 7. At that time you will be able to link from here to CDBaby and purchase a copy. Many Splendid Things new release date is scheduled for mid-October. U.S. and International sales date set for October 30.